PASADENA, Ca. - NASA's newest Mars mission, landing in three days, will draw on support from missions sent to Mars years ago and will contribute to missions envisioned for future decades. "Curiosity is a bold step forward in learning about our neighboring planet, but this mission does not stand alone. It is part of a sustained, coordinated program of Mars exploration," said Doug McCuistion, director of the Mars Exploration Program at NASA Headquarters in Washington. "This mission transitions the program's science emphasis from the planet's water history to its potential for past or present life." As the Mars Science Laboratory spacecraft places the Curiosity rover on the surface of Mars next week, NASA will be using the Mars Odyssey orbiter, in service since 2001, as a relay for rapidly confirming the landing to Curiosity's flight team and the rest of the world. Earth will be below the Mars horizon from Curiosity's perspective, so the new rover will not be in direct radio contact with Earth. Two newer orbiters also will be recording Curiosity's transmissions, but that data will not be available on Earth until hours later. When Curiosity lands beside a mountain inside a crater at about 10:31 p.m. PDT, Aug. 5 (1:31 a.m. PDT Aug. 6), the 1-ton rover's two-year prime mission on the surface of Mars will begin. However, one of the rover's 10 science instruments, the Radiation Assessment Detector, or RAD, already has logged 221 days collecting data since the spacecraft was launched on its trip to Mars on Nov. 26, 2011. 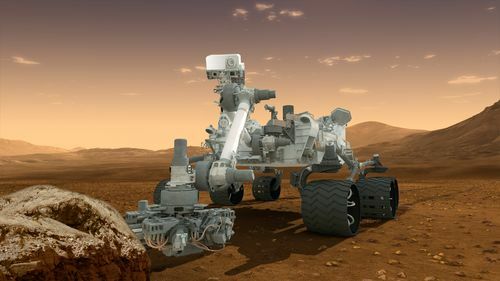 "Our observations already are being used in planning for human missions," said Don Hassler of Southwest Research Institute in Boulder, Colo., principal investigator for Curiosity's RAD. The instrument recorded radiation spikes from five solar flare events spewing energetic particles from the sun into interplanetary space. Radiation from galactic cosmic rays, originating from supernova explosions and other extremely distant events, accounted for more of the total radiation experienced on the trip than the amount from solar particle events. Inside the spacecraft, despite shielding roughly equivalent to what surrounds astronauts on the International Space Station, RAD recorded radiation amounting to a significant contribution to a NASA astronaut's career-limit radiation dose. Curiosity's main assignment is to investigate whether its study area ever has offered environmental conditions favorable for microbial life. To do that, it packs a science payload weighing 15 times as much as the science instruments on previous Mars rovers. The landing target, an area about 12 miles by 4 miles (20 kilometers by 7 kilometers), sits in a safely flat area between less-safe slopes of the rim of Gale Crater and the crater's central peak, informally called Mount Sharp. The target was plotted to be within driving distance of layers on Mount Sharp, where minerals that formed in water have been seen from orbit. "Some deposits right inside the landing area look as though they were deposited by water, too," said John Grotzinger of the California Institute of Technology (Caltech) in Pasadena, project scientist for Curiosity. "We have a great landing site that was a strong science contender for earlier missions, but was not permitted for engineering constraints because no earlier landing could be targeted precisely enough to hit a safe area inside Gale Crater. The science team feels very optimistic about exploration of Mount Sharp and the surrounding region that includes the landing ellipse." Mission engineers designed a sky crane maneuver, lowering Curiosity on nylon cords from a rocket backpack because the rover is too heavy to use the airbag system developed for earlier rovers. "We know it looks crazy," said Adam Steltzner of NASA's Jet Propulsion Laboratory (JPL) in Pasadena, leader of the team that developed the system. "It really is the result of careful choices." By designing the aeroshell enclosing Curiosity to create lift and be steerable, engineers were able to build a system that lands much more precisely instead of dropping like a rock. JPL, a division of Caltech, manages the Mars Science Laboratory for NASA's Science Mission Directorate, Washington. You can follow the mission on Facebook and on Twitter at http://www.facebook.com/marscuriosity and http://www.twitter.com/marscuriosity .